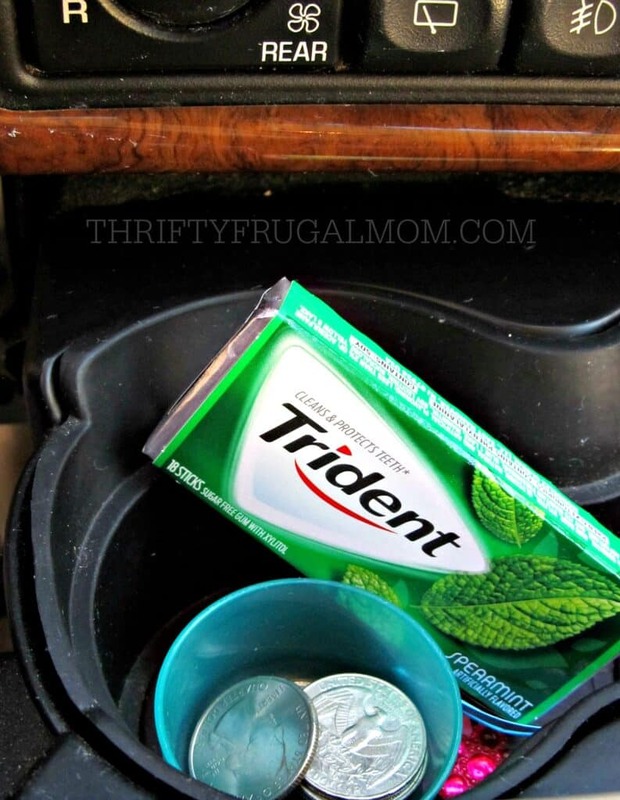 This is a sponsored post written by me on behalf Trident and Mom It Forward Blogger Network. All opinions are my own. 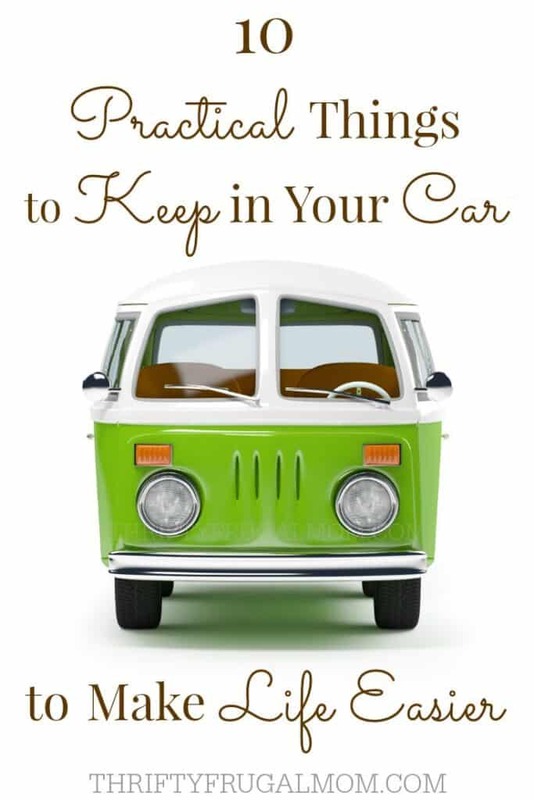 Make life a little easier with this list of practical things to keep in your car! They’ll help you be prepared for both emergencies and the little everyday needs. A post that every mom should read! I’m a big believer that it’s often the little things that make life a bit easier and happier. For me, one of those “little things” is to keep our car stocked with a few practical items- some that help us stave off emergencies and some that are just really convenient. I don’t know about you, but I find being prepared gives me such a satisfied feeling! Runny nose? Check. Spider crawling across your dashboard that need to be squashed now? Check. A child that picked their nose? Check. Yup, keeping tissues in your vehicle is one of those things that just makes life a little easier. One of my best tips for not having a messy car is to have a designated spot for all trash. Our classy solution for a car trashcan is…. (((drum roll)))…a simple ice cream bucket! Okay, so maybe it’s not classy, but it works amazingly well! And we actually go a step farther and line it with a plastic disposable shopping bag. (It adds to the classy look.) It not only keeps the bucket from quickly getting gross inside, but it also makes it super easy to empty the trash once it’s full. Added bonus: If someone gets sick on their stomach while you’re traveling, the trash can comes in handy for other uses too, if you get what I’m saying. I doubt that we’re the only ones who get in the car and and soon realize that we’re in desperate need of lip balm (this classic is our favorite) or hand lotion (we love this hand lotion because it stays on even after washing and a little bit goes a long way, so it last forever!). We finally got smart and just started keeping both things in there at all times. It actually ends up being a time saver too because it means there’s one less thing to do before leaving the house! If you live in or near a city, keeping a small container full of change in your car is super helpful. There’s nothing worse than finding a parking spot only to realize that you don’t have anything to feed the meter! It comes in handy other times, too. Like when you need a quarter for a cart at Aldi or run out of gas and realize that both you and your husband forgot your wallets. (Yes, we actually once bought a half a gallon of gas with all change.) It’s actually surprising how often it comes in handy! Gum has been one of our vehicle must-have’s since back when we were dating! It’s just the perfect convenient thing to grab when you realize you could really use a quick breath freshener. And if you’re like me and occasionally discover that in the chaos of trying to get the family out the door, you apparently forgot to brush your teeth, it just might end up being a lifesaver! We love using Trident gum because it’s sugar-free. Plus it’s good for your oral health too, since it’s been proven to help clean and protect teeth when it’s chewed for 20 minutes after eating and drinking. Isn’t that awesome? Having snacks in the car is such a lifesaver when you end up being out longer than you had planned. Of course, it’s a money saver too, because otherwise, you’d probably end up stopping and getting something to eat. After having our kids get hurt numerous times while we were away from home without any band-aids nearby, we finally got smart and just started keeping some in our car’s glove box. If only all of life’s problems were this easy to solve! I don’t always keep these in our car, but they do show up a lot just because they are so super handy to have around. Wipes clean up grubby kid’s hands like nothing else, get spots out of clothing most of the time, wipe up spills nicely and so much more. I can’t even begin to tell you all the things that I’ve used them for! If you are wanting to stay organized, these wipes that fit in your car’s cup holder sure help. Obviously, this one only applies to those of you that are parents, but I just added these to our vehicle must-have list this year after getting into some not-so-fun situations where we discovered we didn’t have any diapers with us. I have no idea why it took me until child #3 to think of doing this! Do you keep any of these items in your car? What would you add to this list? All of the above:) plus bottled water and a couple empty grocery bags. Oh, the bottled water is smart! Curious what you use the empty grocery bags for? I guess though, now that I'm thinking about it, they'd have quite a few uses, really. We also keep a spare dog leash in the car. Also a blanket because that can be used for many, many things. I can totally see how the dog leash would be super handy if you have pets. Great idea! And I keep thinking that I should toss one of our extra blankets in the back of the van and just never get it done. Reusable grocery bags. The only way for me to remember to use them is to keep them in the trunk, along with an umbrella. Also, they don't clutter up our entry way or get tossed around in the house if they are kept in the car. I like number five. :) I have a special place where I keep my Aldi quarter so it doesn't get spent elsewhere. Also, I really need to get back to number 7. Good list! Hadn't thought of keeping my grocery bags in the car. I finally starting keeping them in my "shopping purse" because I got so tired of forgetting them! And such a smart idea to have an umbrella handy. We have plenty and I think I really should just add one to our van. And #7 is a continual struggle for me. Because too often when we use up the snacks, I forget to replenish them! And as one of those people that needs to eat when they get hungry (I get shaky really fast), having snacks handy is a must! Great list. The most important: a designated spot for trash! This keeps the car much cleaner and more manageable! Both my husband and I can't stand messy vehicles, so our trash bucket gets a lot of use! I have all of these, I have used the "baby" wipes so many times, that I would be lost without them. There is one more thing I keep in the hatch back. Plastic crate I got from the dollar store. Love it! I use it to put my eggs, bread or buns in it when grocery shopping. Other times I'll put smaller things in it so they don't roll around, toys, ect. We use baby wipes so much around here for non-baby things that I know once we no longer need them for diaper changing that I'll still be buying them! And I love the plastic crate idea. It would come in handy for a variety of things! Umbrellas, emergency rain ponchos, ice scraper, reusable grocery bags, hair brush/comb, tooth brush and paste, hair bands, first aid kit, spare socks (I've had to buy socks at kids jumping/activity places), picnic blanket in season, dog leash and folding bowl, balls for dogs and kids and waste disposal bags, reading or activity books, phone charger. Periodically my husband takes stuff out without telling me and confuses me. I modify the list for the season. This is a brilliant and well thought out list! I am notorious for having a messy car, and no matter how much junk I have in there, I never have anything worth while or that I actually need. Thanks for this list! My life would be so much more efficient if I had all of this in my car. Great list! I'm with the other ladies in adding: first aid kit- b/c my little girls are perpetual knee-skinners, an umbrella (which I never use!) a spare set of clothes- my girls are the same size, and this has been a life-saver, hand-lotion, coloring books and crayons, travel brushes, reusable grocery bags, a zip-up picnic blanket, and some toiletries like deoderant etc. as well as everything you listed! Can you tell I'm a little Type A?? Hey, I could benefit from being a bit more Type A. :) And I love the first aid kit idea. We have one in our car, but it's old and was stocked back before we had kids. Recently I needed a band-aid so tried to use one from it and they were so old they wouldn't stick! Oops! Definitely need to update the kid, don't you think? And the umbrella and toiletries are both things we could benefit from too. Great ideas! This a great list! One item I 'be often wished for when in my car is a small pair of scissors or even nail clippers. They would be so helpful if you had a broken nail or were trying to get into a package! Oh, that is such a great idea! I try to keep a nail clippers in my purse because so often I have a broken nail or nail snag that drives me funny when I'm out and about. But sometimes I don't have my purse with me and keeping a pair in the car is genius. Why didn't I think of it before?! :) I actually have a nail clippers that I got free recently with couponing....it's going to go out in the car asap. I keep a spare pair of earring in case I forget to put on a pair before I leave the house. I also keep a small makeup up bag if I don't have time to put on my makeup in the morning or if I need to refresh.